To Cite: Khorram A, Yousefi M, Alavi S A, Farsi J. Convenient Landfill Site Selection by Using Fuzzy Logic and Geographic Information Systems: A Case Study in Bardaskan, East of Iran, Health Scope. 2015 ; 4(1):e19383. doi: 10.17795/jhealthscope-19383. Background: Due to burgeoning population, solid waste site selection is one of the most crucial issues in waste management system. Regarding the complexity of waste management systems, the convenient solid waste site selection involves considering multiple alternative solutions and assessing different criteria. Objectives: The current study, aimed to select the fuzzy logic method as one of the most popular approaches in multi criteria decision analysis (MCDA) to find a new sanitary landfill site through considering various criteria in Bardaskan city, Iran. Materials and Methods: Nine types of criteria divided into two main groups of ecological and economical criteria were involved to select the most convenient landﬁll site. A model based on the multi criteria evaluation techniques and combination of geographical information systems (GIS) with fuzzy logic was employed. The ESRI Arc GIS 10 term system was utilized to manipulate and present spatial data. The fuzzy AND operator was used to overlay all standardized maps. Results: The results of the current research proposed five locations with the fuzzy membership value of more than 0.9 as the best landfill sites in the study area. The sites were located in the North and North East of Bardaskan city. The study demonstrated that 51.97 % of the study area was not suitable for landﬁll location whilst only 7.8 % was highly suitable for landﬁll siting. About 1956.61 hectares of the studied area was suitable for territorial landfill siting. Conclusions: The study results guided the municipality authorities to select the best landfill site among the candidate ones, and due to the broad spectrum of classifications, the output results can enable decision makers to make appropriate decisions to reduce the costs both in economical and bioenvironmental criteria. In the recent decades, the emergence of different physical and social changes, accelerated growth of urban population, industrialization, changes in the lifestyle and living standards of people has had an impressive increase in Municipal Solid Waste Generation (MSWG), which is directly proportional to the changes, geographical locations, time, and season (1, 2). MSWG is the most significant source that without safe and secure disposal, will threaten the global environmental health (3, 4). Based on the type of waste, different methods such as incineration, immobilization, landfilling, offshore and underground disposal are utilized in waste planning and management. Landfilling is a vital component in solid waste management plans, and the most common method of waste disposal in most parts of the world (5, 6). Identifying the best disposal site is the first and the most important step for pollution control and minimizing environmental hazards in solid waste management (7). In many developing and underdeveloped countries, most solid waste is landfilled but the difference is that developed countries use secured and controlled processes in landfilling (8). Sanitary landfill is the most cost-effective system of solid waste disposal for most urban areas in the developing countries (003). Convenient Landfill Site Selecting (CLSS) is one of the most important choices in the process of secured and controlled waste management, (6, 9)that may play a significant role in reducing the environmental contamination (3, 6, 10). The population growth and production development in any town or country requires identification of the principles to determine the best disposal location for solid wastes considering several factors (7). Convenient Landfill Site Selecting (CLSS) depends on various criteria such as land slope, topography, land use, climate, earthquake, distance from urban areas and the main roads. Therefore, site selection is considered as a Multiple-Criteria Decision-Making (MCDM) problem (11). There are several techniques for landfill site selection process. The most common ones are: Combination of Analytical Hierarchy Process (AHP) with Geographic Information System (GIS) (12), Analytic Network Process (ANP) (13), and intelligent system (14). 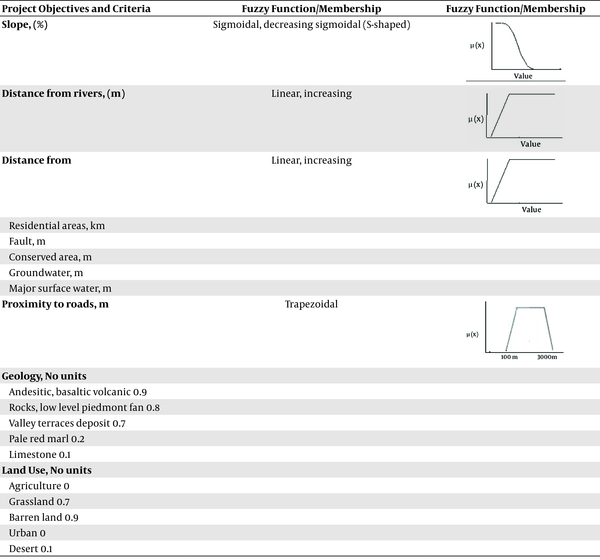 The parameters involved in landfill site selection cannot be given precisely, whereas the assessment factors of solid waste site suitability for the subjective criteria are commonly presented linguistically In the fuzzy set, linguistic terms such as low suitable, suitable, and high suitable can be represented by membership functions, valued in the actual unit interval [0,1], which translate the imprecision and vagueness of human opinion regarding the main problem (15). The potential of representing vagueness or indecisive data in a natural form could be introduced as an important usage of fuzzy set theory (16). This capability of fuzzy logic is used to select landfill site by many researchers (17-19). Due to the urbanization and life style changes, the waste generation rate in the Bardaskan city is increasing. In this city, waste is landfilled flatly in a place outside the city, after collection (Figure 1). Figure 1 shows the current municipal solid waste landfill site associated with three major criteria namely fault, groundwater and urban area. As it can be observed, landfill site is located near the criteria that may cause many problems for the residents. The current study aimed to determine the convenient landfill disposal site by using multi-criteria decision making process based on fuzzy logics to overcome the problems arising from improper landfilling. The current study was done in Bardaskan city in Khorasan Razavi province, South-East of Iran. To select the most convenient landﬁll site, nine types of criteria divided into two main groups of ecological and economical criteria were involved. In this study, a model based on the multi-criteria evaluation techniques and combination of geographical information systems (GIS) with fuzzy logic was employed. To manipulate and present spatial data, the ESRI Arc GIS 10 term system was applied and to overlay all standardized maps the "fuzzy AND" operator was utilized. 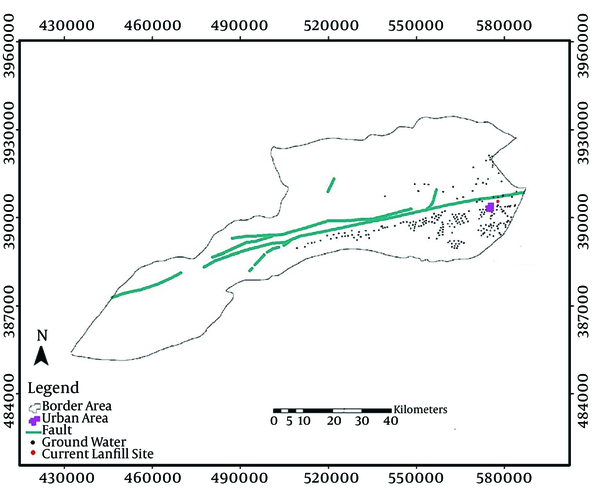 A model based on the multi-criteria evaluation techniques and the combination of Geographical Information Systems (GIS) with fuzzy logic was used to select the most convenient place for municipal landfill sites. The framework of this technical evaluation procedure is shown as a flowchart in Figure 2. The ESRI Arc GIS 10 term system (a computer system for performing geographical analysis) was used to process the data. The study area is located in Bardaskan city in Khorasan Razavi province, Iran. The Bardaskan city is limited to Sabzevar from the North, to Semnan province from the West and to Khalilabad from the East (Figure 3). Namak Desert (salt desert) is located in the South part of this county. The Great Kavir-Doruneh fault passes East-West from North of Bardaskan. 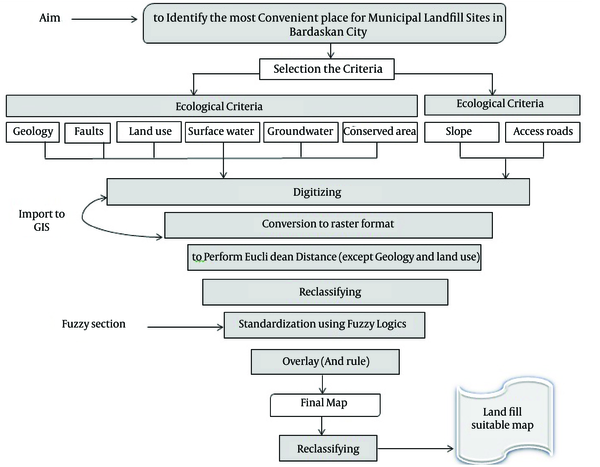 There are different types of criteria to select the convenient landﬁll site, but the current study employed two major groups, ecological criteria (geology, the faults, population centers, land use, surface water, groundwater, and conserved areas) and economical criteria (roads and slopes) to select the most suitable place based on the available data and previous researches (9, 14, 16) Each criterion was prepared as a map from different sources. 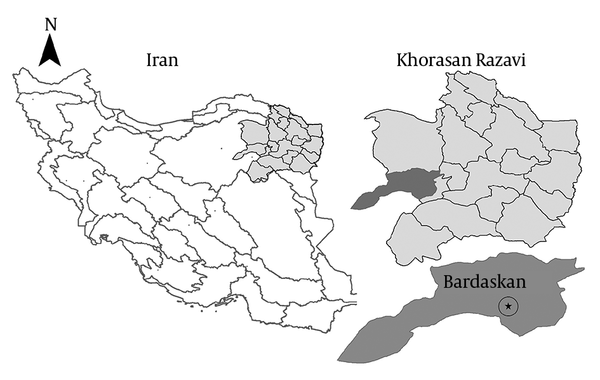 The land use map, prepared by the natural resources organization of Khorasan Razavi province, then it was digitized and converted to raster format in spatial analyst tool in the ArcGIS term system. A raster format consists of pixels organized into rows and columns where each cell contains a value representing information. The classes of land use map included agriculture, grassland, barren land, urban area and dessert. Roads network map from roads and urban development office of Khorasan Razavi province was obtained. The roads were digitized and rasterized. The surface water was digitized and converted to raster format from topographic map. A digital elevation model was downloaded from US geological survey (USGS) site, based on the generated slop map. The faults and geological map acquired from geology survey of Iran were also digitized and rasterized. The classes of geological map include andesitic, basaltic volcanic, rocks, low level piedmont fan, valley terraces deposit, pale red marl, and limestone. The digitalized groundwater, population centers, and conserved areas were acquired from environmental protection organization of Khorasan Razavi province. The maps were also converted to raster. Finally geographic data were established based on the mentioned data in GIS. In this section, a membership function was determined for each criterion. Choosing suitable fuzzy function is essential for criteria standardization. The standardization process is described as a relative grade of belonging to a fuzzy set. This allows the function to be asserted with the trivial degree of vagueness and can take on a continuous range of values including suitable (one) to unsuitable (zero) and any shades in between. 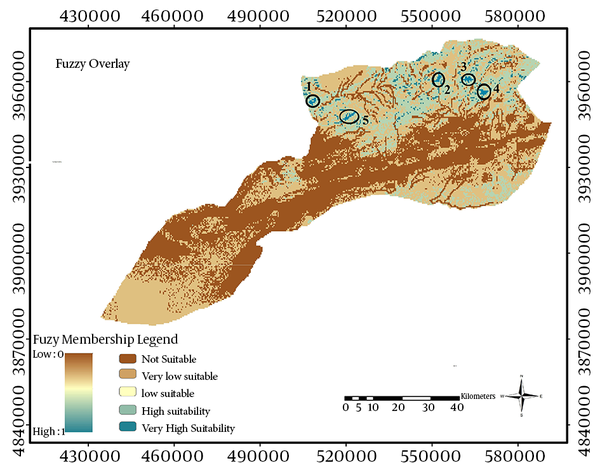 Therefore, the generated fuzzy maps for each criterion had the membership values between zero and one that zero illustrated the least suitable areas and one illustrated the most suitable areas for landfill siting. This method allocated a scale between zero and one as fuzzy numbers to all criteria on that scale to show the meaning of the linguistic terms (20). The fuzzy memberships and their linguistic terms, applied in the current study, are represented in Table 1. On wider areas, slope of land is an economically important factor in the landfill site selection process. It is suggested that the gradient of 0%-10% has the highest suitability (membership values = 1) and 40%-50% has lowest suitability (membership values = 0) (21, 22). Therefore a sigmoidal (S-shaped) decreasing function was selected for this criterion. In the current study, land use area was classified into five groups namely agriculture, urban, barren land, grassland, and desert. For land use criterion, the most desirable land is barren land, and the lowest desirable land is agriculture and urban area. According to this, the membership function was considered 0 for agriculture and urban, 0.9 for grassland and desert, and 1.0 for Barren class. Proximity to roads is defined as an economical factor in order to facilitate and reduce the cost of transportation (23). Different studies used various distances from the main roads such as buffer 0.2 to 10 km (24), 1 km (25), and maximum 2'500 km (23). Shahabi et al. used more than 2 Km in their study (26). Bardaskan is a fast-growing city; therefore, to confide that the landﬁll site is not very close to the roads and future infrastructures, the current study kept at least 1 km (membership values = 1) distance from the road and the maximum distance of 3 km (membership values = 1). More and less than this distance will have low membership values. Therefore, a trapezoidal membership function was selected for this criterion. In the current study, at least 500-meters buffer zone from the major surface water and faults, 1500 meters from groundwater, 150 meter from conserved areas, and 1 Km from residential areas were selected. (9, 22, 27). Therefore, a linear increasing fuzzy function was used for the criteria. Membership values for each criterion are presented in Table 2. All criteria were standardized by using the fuzzy membership functions from Table 2. At this point, in order to provide output map and select the best landfill locations, the map layers are combined. There are some operators to overly the membership values, such as AND, OR, algebraic product, sum, and gamma (21, 28). The output of these operators could be different. The output membership values of the fuzzy logic OR operator are controlled by the highest values of each input map. The result of the sum operator is always larger than (or equal to) the largest contributing fuzzy membership value. Fuzzy gamma is a compromise between the increasing tendencies of the fuzzy algebraic sum. The Fuzzy gamma type is an algebraic product of fuzzy product, and fuzzy sum. Fuzzy AND results in a conservative assess sets of membership, through a tendency to generate small values (28). In the current study, to combine the fuzzy membership values, the fuzzy AND operator was considered. The fuzzy logic AND operator can develop a new fuzzy set with a membership function that comprises the minimum degrees of relevance within each factor. In other words, the effect of this operator causes the output map at a conservative estimate, controlled by the smallest value of fuzzy membership in each location. The fuzzy logic AND operator can be defined as equation 1 (29). Where µ combination was the output map, µ1 was the membership value for map 1, µ2 was the value for map 2, etc. The fuzzy logic AND operator is appropriate where two or more places of criteria for a propose, must be present together for the true position (28). At this stage of the research, the obtained layers from the previous step are combined by fuzzy AND operators. The study area was classified according to the fuzzy membership from no suitability to very high suitability. The areas with the fuzzy membership value of more than 0.9 were selected to depict the very highly suitable areas for landfill sites. To select the candidate landfill site, areas with the extent of lower than 300 ha were omitted, because of the allocation of landfill for a period of 20-years or more (13). Consequently, five sites were identified. A field visit was arranged for each candidate landﬁll site with high suitability values. The current study focused on the selection of suitable landfill sites for Bardaskan, Iran. Nine landfill site selection criteria were used. Each of the criteria was as a map in digital form. The fuzzy set theory was applied to standardize the criteria and produce their maps by different fuzzy membership functions. This theory can afford to figure a multitude of uncertain and vague concepts, variables, and systems, into mathematical and natural forms and obtain the basis for ratiocinating, controlling and decision making in an uncertain situation (30, 31). All maps were standardized by the appropriate fuzzy membership functions (Table 2). Figure 4 shows the standardized maps for each criterion. After overlaying all standardized maps using AND operator, in order to illustrate the best selected sites among the other values, the overlaid map was classified into five categories ranging from no suitability to very high suitability. Table 2 shows the linguistic terms for selecting landfill sites, their fuzzy membership and the study area of all categories. Figure 5 indicates the proposed landfill sites. This figure shows the final map generated by the implementation of fuzzy method obtained from overlying the standardized maps of different criteria by fuzzy AND method. The membership value of 0 and 1 are represented by dark brown and dark blue colors in the figure, respectively. This map was reclassified into four classes from No Suitability class (0-0.1) to Very High Suitability class (0.9-1). According to Table 3, almost more than half percent of the study area (51.97%) was no suitability for landfilling and 25.12, 25.12, 10.5, 4.7, and 7.8% were with very low, low, high, and very high suitability, respectively. All five suitable sites for landfilling regions were in the North and North-East of the studied city. It shows the areas that were very highly suitable for landﬁll sites too. Table 4 shows the descriptions of each selected landfill site, and the distance from each criterion to each site in meters. According to Table 4, in all sites, the slope was less than 10%, and the distance from faults and residential areas were more than 1500 meters. In the current study, the most appropriate distance from underground water was considered 1500 meters. However, this distance in all sites was nearly more than 5000 meters. It was considered more than 500 meters away from the river, but, this distance in sites three and four were 436 and 421 meters respectively, and in other sites it was more than 600 meters away. In all sites, the distance from the protected areas was more than 7 km. All sites were located in acceptable land use and geological characteristics. In the current study, the distances from the roads were intended between 1-and 3 km. In sites 2 and 4, the distance was less than 3 km, but, in the other sites it was more than 3 km. The results of performing fuzzy logic in GIS environment were summarized in Table 5. This table shows shows the area and coordinates of the suitable regions for each landfill site. In this paper, a fuzzy method was used to determine the best landfill site. This method determined the selected site by the membership values of each class, instead of considering suitable or unsuitable classes. It means that in the final map, it the location is determined based on the continuous membership values from 0 to 1. The fuzzy membership value of 0 indicates the undesirable and unsuitable conditions and membership value of 1 represents the suitable conditions in terms of the criteria to select the convenient landfill site. Landfill is considered as the cheapest method for the final disposal of municipal solid waste and is commonly used worldwide (32, 33). The landfill site selection procedure is a technique to valuate the suitable sites by identifying a limited number of sites (19). The current study aimed to analyze the eligible and convenient landfill sites for solid waste in Bardaskan, Khorasan Razavi province, Iran. A fuzzy logic method was selected as one of the most popular approaches in multi criteria decision analysis (MCDA) in CLSS. The fuzzy approach was employed to allocate the appropriate landfill sites to dispose solid waste. Decision making in imprecise, ambiguous, and multi criteria situations, make the decision appear unmanageable. Therefore, to represent vague or indecisive data in a natural form, the fuzzy logic sets theory was utilized in order to develop a satisfactory decision. The GIS software was applied to standardize and overlap all maps. GIS was used to manipulate and present spatial data. By considering a multi-criteria approach, several criteria were selected namely land use, surface and sub-surface water, geology, conserved area, faults (as ecological criteria), road and Slope (as economical criteria). Wang et al. investigated two environment and economy criteria to select the landfill site in China (22). The fuzzy approach allowed a function to be asserted with trivial degree of vagueness and took a continuous range of values including one for suitable, to zero for unsuitable, and any shade in between. By contrast, Boolean logic is used when the maps parameter are classiﬁed into suitable Boolean (one) and unsuitable Boolean (zero) categories. Therefore, in Boolean method, the final map will be a binary map (34). According to Afzali et al. the fuzzy logic method (zero to one) which considers different levels of membership was more flexible than the Boolean logic method (zero and one) (13). In the current study, the areas with the fuzzy membership value of greater than 0.9 were selected to depict the very high suitable areas for landfill sites. Therefore, the final map was not a binary map and illustrated the suitability of area in a contentious fuzzy membership from not suitable to very highly suitable. Also the areas lower than 300 ha were omitted from very highly suitable areas. Afzali et al. used ten factors with fuzzy method to locate a landfill site and also selected areas with more than 136 ha (13). The study demonstrated that 51.97% of the study area was not suitable for landﬁll location whilst only 7.8% was very highly suitable for landﬁll siting. Gbanie et al. identified municipal landﬁll sites in urban areas in Sierra using the fuzzy method. They classified the logical locations of municipal landfill into ten categories ranging from nt suitability to very high suitability class. Their study revealed that 83.3% of the study area was not suitable for landﬁll location and just 2.1% was very highly suitable for landﬁll siting (23). Afzali et al. presented a multi criteria evaluation method using GIS technique for landfill suitability site evaluation in Isfahan, Iran. They showed five regions as the most suitable areas for landfill site selection (13). In the present study, five areas were identified as the most suitable sites -appropriate for landfills in the study area (Figure 5). Table 3 presents features of the sites. It should be considered that in the study area, it is not always possible to determine a suitable site with optimum conditions. For instance, in this research, it was not possible to have all optimum conditions. In sites 3 and 5, the distance from the main road was more than 3 km, or in sites three and four, the distance from the river was less than 500 meters. Since Bardaskan is a dry and hot city with no permanent rivers; therefore, the distance from the rivers can be ignored (or considered 500 meters). However, due to the identified locations in the study, the most appropriate site is the site with the best conditions for landfilling. Candidate and convenient landﬁll site is the location with the highest fuzzy membership or with high suitability values of the criteria for landfill site selection in the study area. - Landfill site selection process determined as multi-criteria and applying further criteria in the study can help the decision makers to make better decision to find an appropriate location for landfills. Whereas, in the current study, all known criteria that are using in landfill site selection process were not covered in the study, so it can be known as a study limitation. It is suggested that further studies use further criteria in the process of selecting the most suitable site for landfill. Also, assessment of the environmental impact of the proposed location would prevent the occurrence of potential problems. In conclusion, the landfill site selection process is a technique to assess the basic appropriate sites and selecting a limited number of landfill sites by a detailed technique. In the current study, the usage of the fuzzy sets theory to describe the uncertainties in various factors, simplifies the complex structure of the decision making phase and assists to overcome vagueness in selecting the landfill site. The study results guided the municipality authorities to select the best landfill site among the candidate ones. Furthermore, due to the broad spectrum of classifications, the output results can increase the power of decision makers to make appropriate decisions to reduce the costs both in economical and bioenvironmental criteria. We, hereby, express our gratitude to Bardaskan municipal authorities for providing the data and information required in the study. Authors’ Contributions: The overall implementation of this study including designing, data providing and analysis, and manuscript preparation were the result of equal efforts by individuals who are listed as co-authors of this paper.